In this paper we introduce JMSeq, a Java-based tool for monitoring sequences of method calls. JMSeq provides a simple but expressive language to specify the observables of a Java program in terms of sequences of possibly nested method calls. Similar to many monitoring-oriented environments, verification in JMSeq is done at run-time; unlike all other approaches based on aspect-oriented programming, JMSeq uses code annotation rather than instrumentation, and therefore is suitable for component-based software verification. Nobakht, B, de Boer, F.S, Bonsangue, M.M, de Gouw, C.P.T, & Jaghouri, M.M. (2014). 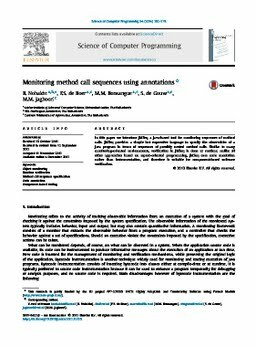 Monitoring method call sequences using annotations. Science of Computer Programming, 94, 362–378.